On Thursday, Egypt's minister of antiquities Khaled Al-Anany announced that the newly discovered parts of a colossus statue for an ancient Egyptian king in a North Cairo did not belong to King Ramses II as initially announced and believed. The partial statue most probably belonged to 26-dynasty King Psamtik I, a less known pharaoh who actually did heroic things in his reign above them freeing Egypt from the Assyrian Empire and unifying it as well. in Cairo last Thursday "Reuters"
The announcement puts an end of a very exciting Egyptian black comedy. 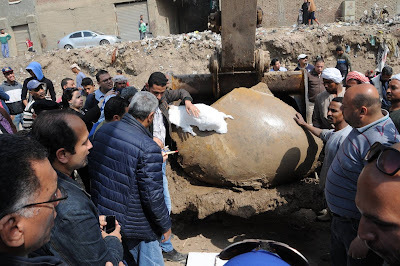 It started on 9 March when the ministry of antiquities announced that two newly discovered ancient Egyptian statues were unearthed by a joint Egyptian-German archaeological mission from a mud pit at a Cairo local market "Souq Al-Khamis". 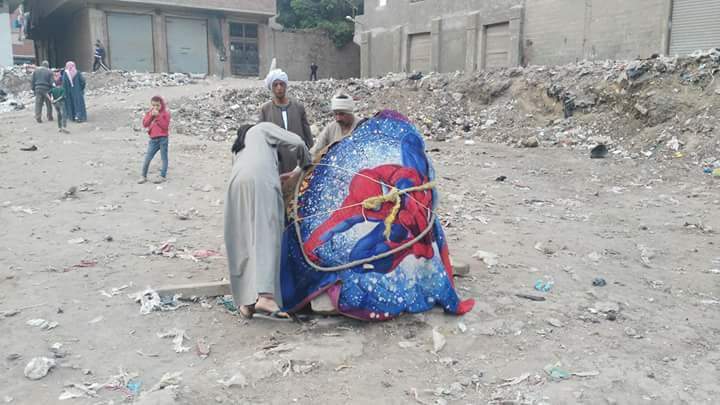 "Souq Al-Khamis" is located in populated working class Al-Matareya district, Ain Shams. According to the first statement issued by the ministry, the two new "19th dynasty" royal statues were found in "parts" in the vicinity of King Ramses II temple dedicated to the God of the sun in ancient Heliopolis "Oun". The statement described the first statue as an 80 cm tall bust of King Seti II carved in limestone with fine and clear facial features. On the other hand, the second statue is actually a 8 meters long bust carved in the strong quartzite. 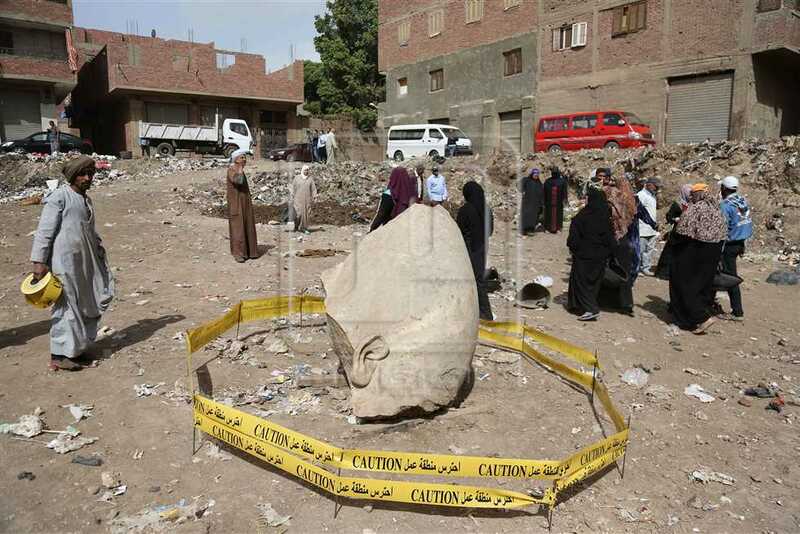 Lacking any engravings on that part bust identifying the statue's owner, the archeologists suggested it could be part of Ramses II's statue as it existed on what they believed to be Ramses II temple's entrance in the city of Oun. "Plus the late King loved having his statues everywhere"
The Egyptian team described the discovery as very important because it showed that the sun temple was enormous with many huge statues and obelisks. The temple was damaged according to archeologists during the Greco-Roman and that many of its obelisks and colossi were transferred to Alexandria and Europe. Also during the Islamic era, the blocks of the temple's remains were used in building Cairo in the tenth century. The whole world went mad on that day and the foreign media spoke about the new discovery of "Ramses II statue " despite archeologists said that "it could be Ramses II" only and we found sensational headlines like "Ozymandias returns back in a Cairo slum". Back in Cairo and its slums, it was something different because Egyptians were focusing on other things in that discovery for nearly four days other than the greatness of Ozymandias and how he ended up in ruins in a slum. 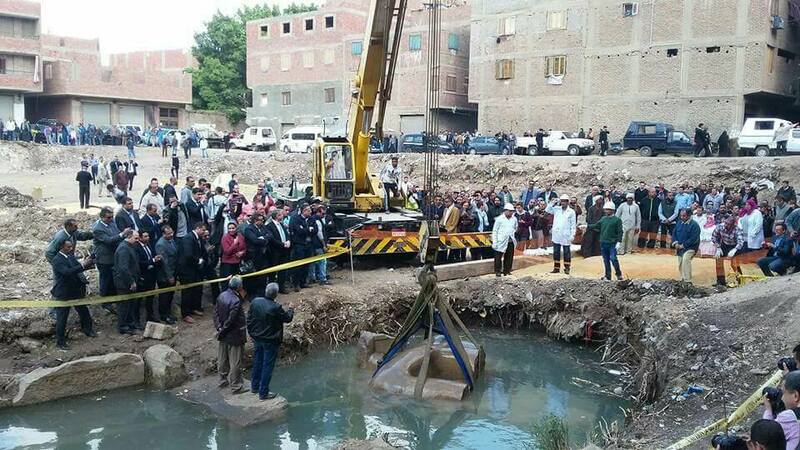 As the photos and videos emerged from Matareya, many Egyptians were stunned and shocked to see one of the statues pulled out of the mud pit using a bulldozer. Yes, a bulldozer was used to dig the first part of the statue, its right ear and partial parts of his left ear and crown out of the mud pit. 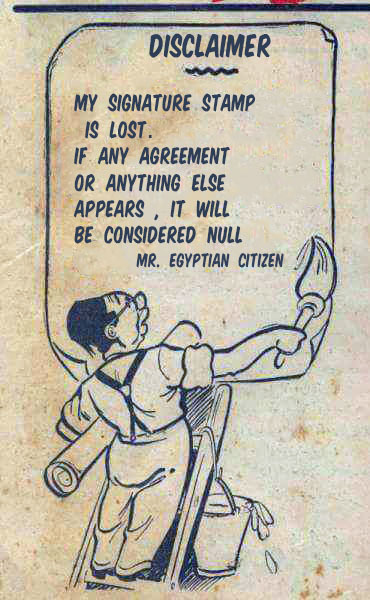 Despite most of those concerned Egyptians are not archeologists, they felt that there was something wrong. They even suspected that the bulldozer destroyed the statue into two halves. As Egyptians, we are used to seeing photos and videos of antiquities excavation and we have not seen that a bulldozer being used before. Personally, I was concerned that that bulldozer could destroy whatever beneath or beside that piece of a colossus causing a collapse but I thought at the same time that it could be the only way to pull such heavy thing. I knew that the there were two parts of the colossus already and the bulldozer is innocent of destroying them because I read both statements of the German commission in Egypt and the ministry. Still, we are speaking about an Egyptian ministry and Egyptian people usually mistrust their government. Needless to say, the antiquities ministry issued a statement defending on March 9 evening what had done. 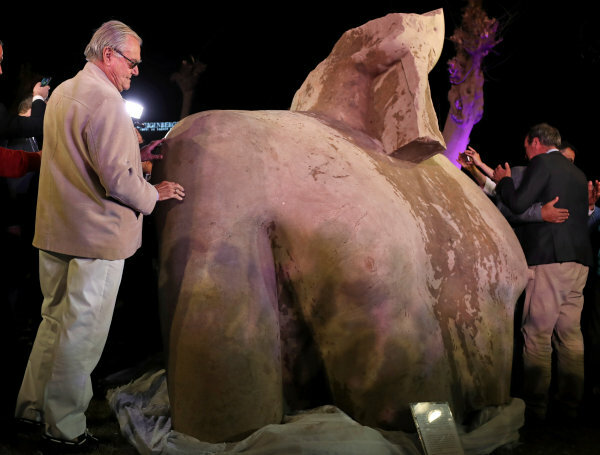 The ministry stated that bulldozer was used only to dig up the statue's head while the lower part was still in the mud. The statement added that the bulldozer did not affect the statue and it was used under the supervision of the German and the Egyptian archeologists. Next day the ministry published a statement by its former minister and renowned archeologist Zahi Hawass defending the way the Seti II was pulled by. Those concerned Egyptian citizens did not believe the ministry nor Hawass' statement and kept criticizing the ministry. The head of the German archeological mission Dr. Dietrich Raue also spoke and stated in a cute Upper Egyptian accent that it was completely correct to use the small bulldozer because the head was extremely heavy. Soon enough, renowned archaeologist Monica Hanna spoke about the matter in a balanced way.
" The lifting of the head statue seems to happen in a particularly difficult situation with (sewage) water all over the place. This water leaks into the area from the illegal buildings erected on the extension of the former archaeological site." She also added a very important remark. In normal archaeological practice, it is recommended to pump away the water before any operation. In addition, heavy objects are usually lifted using belts/ropes or are padded to avoid contact with the metal parts of the fork lift as there is always risk of shock however minimal during the difficult operation. In her statement, Hanna raised a very important issue that was completely ignored by mainstream media as well the social media. It is the true problem in this whole matter. It turned out that both colossi were discovered in a former archeological land that was ceded by the antiquities ministry to the ministry of endowment to build a new market for street vendors aka "Souq Al-Khamis" !!!!!! 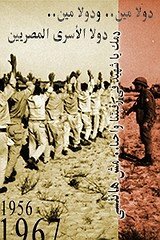 Yes, the Egyptian officials claimed at first that the area had no historical interest !! It is interesting because in 1990 this land or rather 54 fedans were under the antiquities ministry or rather the supreme council of antiquities because it is the location of ancient Oun city. Also, in 2005 the German archeologists started their excavation there and they found the remains of Oun temple as far as I read in 2006. That location already fell under the curse of illegal construction violations as you see from the footage and photos with all those surrounding red brick informal buildings. In July 2014, I found in the news archives that Cairo governor and ministers of endowment and antiquities how to better invest in those fedans !!! They agreed to build a market called "Khamis market" to solve the traffic and street vendors problems in Matareya there !! Ironically that 2014 news spoke about German archeological mission searching for artifacts in the area that would finish its work within 5 or 3 months !! 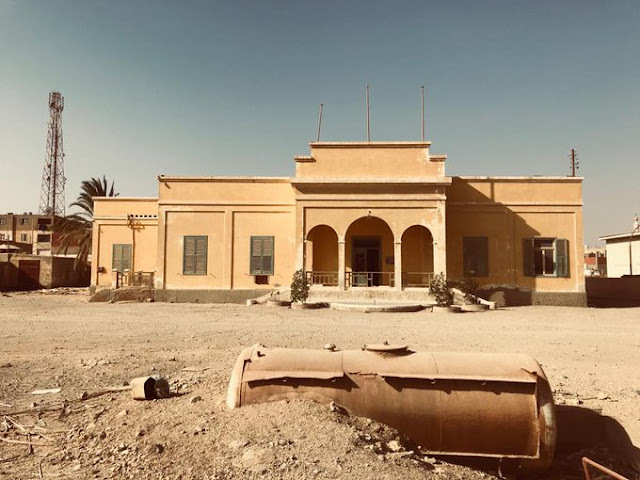 Realistically speaking I thinking the German archeological mission could not finish its work in Matareya due to the deadly clashes between Pro-Morsi supporters from local residents and security forces in that year. Tens of people died as I remember in 2014 there. The news also spoke about parts of the old Oun city were found there while building that new market and its related buildings !!!! Another news from 9 February 2017, I found endowment ministry wanted to hire consultants for its market project. One month before the discovery, the government was just thinking about its market there with its 323 shops and 264 residential unit !! Anyhow, the people and the media ignored and focused on the bulldozer fiasco and the locals of Matareya !! The locals of Matareya dared to act in a simple way with the remains of the mighty rulers of Egypt. Some people were angry on how the simple kids acted and took selfies with the Ozymandias' supposed head with their slippers. 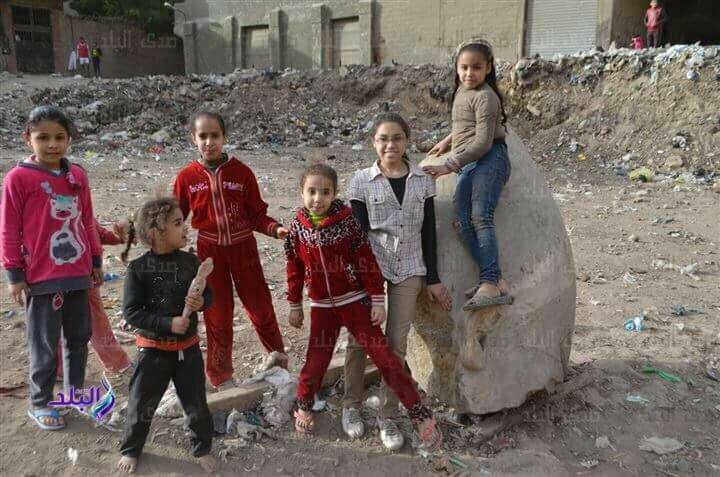 The children playing with the head of the statue "Sada El-Balad"
They were angry how the yellow caution tape did not stop the people of Matareya from taking photos with that head normally. 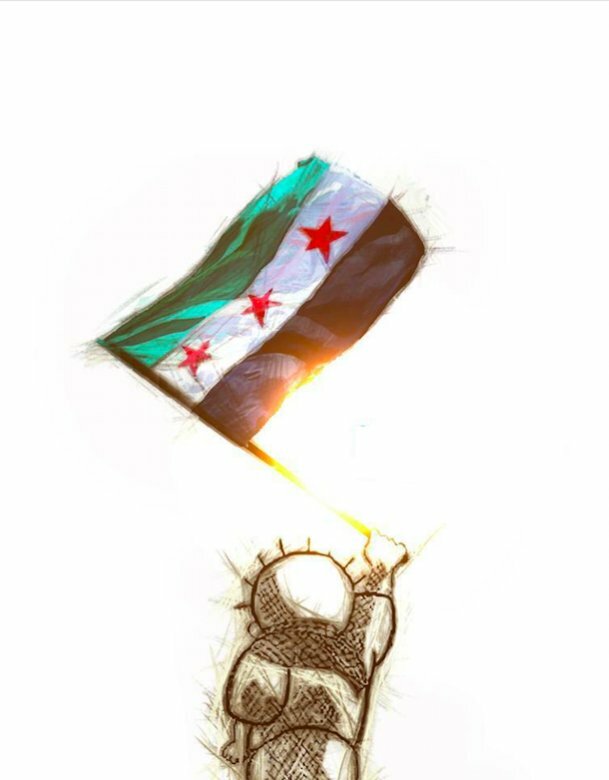 The yellow caution tape surrounding the head "Al-Masry Al-Youm"
They were angry how a Spider-man blanket covered the head. Four days later, Egyptians had another date with the Matareya and its Khamis market full of antiquities. The German Egyptian archeological mission succeeded in lifting the second part of the statue from a pit in a North Cairo district and it was a big cheerful scene. There were no bulldozers used this time. A big crane with bedded ropes was used in the correct way to lift up the second part of Ramses II statue which almost weighs 3 tons alone. According to the Egyptian officials, the German and Egyptian prepared for the lifting operation since Sunday. Some of the archaeologists and workers wore gloves. Expert workers who got experience in dealing with antiquities were brought up from Qift city, Qena. As their neighborhood became a scene for an event followed by the whole world, the local residents watched the scene. Many of them were excited. I see in the videos many kids skipped school on Monday watching and cheering for the late Pharaoh in some surreal scene. The kids and teenagers chanted Ultras-alike chants for Ramses II !!! I think the famous king would love those chants !! Boldly, minister of antiquities Khaled Al-Annay claimed that he refused the use of the bulldozer respecting the feelings of Egyptians only !! I do not know what to say but let's agree on a fact here. Social media plays a role in delivering public opinions to officials. King Pstamik I returned back to life again. On the other hand, Matareya and its people are ignored once again in the media. Egypt is known as historical places.